by Chris Woodford. Last updated: August 4, 2018. Even the best artists struggle to show us what real-world objects look like in all their three-dimensional (3D) glory. Most of the time that doesn't matter—looking at a photo or sketch gives us a good-enough idea. But if you're in the business of developing new products and you need to show them off to clients or customers, nothing beats having a prototype: a model you can touch, hold, and feel. Only trouble is, models take ages to make by hand and machines that can make "rapid prototypes" cost a fortune (up to a half million dollars). Hurrah, then for 3D printers, which work a bit like inkjets and build up 3D models layer by layer at up to 10 times the speed and a fifth the cost. How exactly do they work? Let's take a closer look! Photo: 3D printing in action: this is the printhead of an Invent3D printer, slowly building up an object, layer by layer, by squirting molten blue plastic out of its precisely moving nozzle. Photo by Cpl. Justin Updegraff courtesy of US Marine Corps. 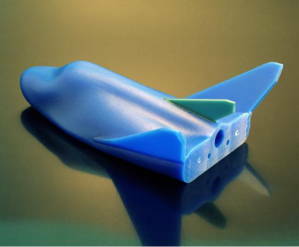 Photo: A high-quality rapid prototype of a space plane made in wax from a CAD drawing by NASA. Photo courtesy of NASA Langley Research Center (NASA-LaRC). Before there were such things as computer-aided design (CAD) and lasers, models and prototypes were laboriously carved from wood or stuck together from little pieces of card or plastic. 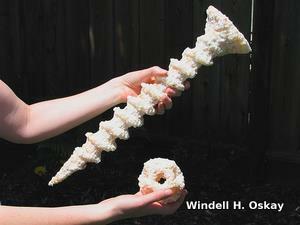 They could take days or even weeks to make and typically cost a fortune. Getting changes or alterations made was difficult and time-consuming, especially if an outside model-making company was being used, and that could discourage designers from making improvements or taking last-minute comments onboard: "It's too late!" With the arrival of better technology, an idea called rapid prototyping (RP) grew up during the 1980s as a solution to this problem: it means developing models and prototypes by more automated methods, usually in hours or days rather than the weeks that traditional prototyping used to take. 3D printing is a logical extension of this idea in which product designers make their own rapid prototypes, in hours, using sophisticated machines similar to inkjet printers. Artwork: One of the world's first three-dimensional FDM printers, developed by S. Scott Crump in the 1980s. In this design, the model (pink, 40) is printed on a baseplate (dark blue, 10) that moves in the horizontal (X–Y) directions, while the print head and nozzle (2 and 4, orange) move in the vertical (Z) direction. The raw material for printing comes from a plastic rod (yellow, 46), melted by the print head. The heating process is carefully regulated by a thermocouple (electrical heat sensor) connected to a temperature controller (purple, 86). The rod is extruded using compressed air from the large tank and compressor on the right (green, 60/62). Things have changed a bit since then, but the basic principle (of building up an object by melting and depositing plastic under three-dimensional control) remains the same. Artwork from US Patent 5,121,329: Apparatus and method for creating three-dimensional objects by S. Scott Crump, Stratasys Ltd, June 9, 1992, courtesy of US Patent and Trademark Office. Imagine building a conventional wooden prototype of a car. You'd start off with a block of solid wood and carve inward, like a sculptor, gradually revealing the object "hidden" inside. Or if you wanted to make an architect's model of a house, you'd construct it like a real, prefabricated house, probably by cutting miniature replicas of the walls out of card and gluing them together. Now a laser could easily carve wood into shape and it's not beyond the realms of possibility to train a robot to stick cardboard together—but 3D printers don't work in either of these ways! A typical 3D printer is very much like an inkjet printer operated from a computer. It builds up a 3D model one layer at a time, from the bottom upward, by repeatedly printing over the same area in a method known as fused depositional modeling (FDM). Working entirely automatically, the printer creates a model over a period of hours by turning a 3D CAD drawing into lots of two-dimensional, cross-sectional layers—effectively separate 2D prints that sit one on top of another, but without the paper in between. Instead of using ink, which would never build up to much volume, the printer deposits layers of molten plastic or powder and fuses them together (and to the existing structure) with adhesive or ultraviolet light. Q: What kind of "ink" does a 3D printer use? A: ABS plastic! Where an inkjet printer sprays liquid ink and a laser printer uses solid powder, a 3D printer uses neither: you can't build a 3D model by piling up colored water or black dust! What you can model with is plastic. A 3D printer essentially works by extruding molten plastic through a tiny nozzle that it moves around precisely under computer control. It prints one layer, waits for it to dry, and then prints the next layer on top. Depending on the quality of the printer, what you get is either a stunning looking 3D model or a lot of 2D lines of plastic sitting crudely on top of one another—like badly piped cake icing! The plastic from which models are printed is obviously hugely important. Photo: The plastic cases of computers, computer peripherals (mice, keyboards, and printers), and other electronic gadgets (calculators and cellphones) are typically from ABS plastic. 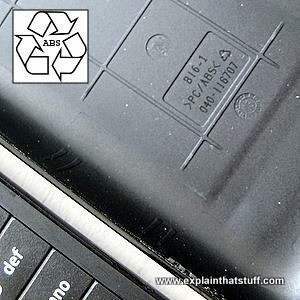 This is the inside of a cellphone case, showing where it's marked ABS with a recycling symbol (larger, inset). When we talk about plastic, we generally mean "plastics": if you're a diligent recycler, you'll know there are many types of plastic, all of which are different, both chemically (in their molecular makeup) and physically (in the way they behave toward heat, light, and so on). It's hardly surprising that 3D printers use thermoplastics (plastics that melt when you heat them and turn solid when you cool them back down), and typically one called ABS (acrylonitrile butadiene styrene). Perhaps most familiar as the material from which LEGO® bricks are made, ABS is also widely used in car interiors (sometimes in outside parts such as hubcaps too), for making the insides of refrigerators, and in plastic computer parts (it's quite likely the mouse and keyboard you're using right now are made from ABS plastic). So why is this material used for 3D printing? It's really a composite of a hard, tough plastic (acrylonitrile) with a synthetic rubber (butadiene styrene). It's perfect for 3D printing because it's a solid at room temperatures and melts at a little over 100°C (220°F), which is cool enough to melt inside the printer without too much heat and hot enough that models printed from it won't melt if they're left in the Sun. Once set, it can be sanded smooth or painted; another useful property of ABS is that it's a whiteish-yellow color in its raw form, but pigments (the color chemicals in paint) can be added to make it virtually any color at all. According to the type of printer you're using, you feed it the plastic either in the form of small pellets or filaments (like plastic strings). You don't necessarily need to print in 3D with plastic: in theory, you can print objects using any molten material that hardens and sets reasonably quickly. In July 2011, researchers at England's Exeter University unveiled a prototype food printer that could print 3D objects using molten chocolate! Photo: A B9Creator™—a typical low-cost, DIY 3D printer. It was originally available in kit form, priced at $2495; now it comes ready-assembled in three different versions priced from $6000–12000. Photo by courtesy of Windell H. Oskay, www.evilmadscientist.com, published on Flickr in 2012 under a Creative Commons Licence. Makers of 3D printers claim they are up to 10 times faster than other methods and 5 times cheaper, so they offer big advantages for people who need rapid prototypes in hours rather than days. Although high-end 3D printers they are still expensive (typically about $25,000–$50,000), they're a fraction the cost of more sophisticated RP machines (which come in at $100,000–$500,000), and vastly cheaper machines are also available (you can buy a Tronxy 3D printer kit for around $100–200). They're also reasonably small, safe, easy-to-use, and reliable (features that have made them increasingly popular in places such as design/engineering schools). On the downside, the finish of the models they produce is usually inferior to those produced with higher-end RP machines. The choice of materials is often limited to just one or two, the colors may be crude, and the texture may not reflect the intended finish of the product very well. Generally, then, 3D-printed models may be better for rough, early visualizations of new products; more sophisticated RP machines can be used later in the process when designs are closer to finalization and things like accurate surface texture are more important. What can you use a 3D printer for? It's a bit like asking "How many ways can you use a photocopier?" In theory, the only limit is your imagination. In practice, the limits are the accuracy of the model from which you print, the precision of your printer, and the materials you print with. Modern 3D printing was invented about 25 years ago, but it's only really started to take off in the last decade. Much of the technology is still relatively new; even so, the range of uses for 3D printing is pretty astonishing. 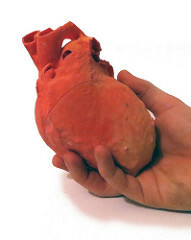 Photo: 3D-printed plastic hearts make it possible for surgeons to practise operations with no risk. Model by Dr. Matthew Bramlet. Public domain photo published on Flickr courtesy of US NIH Image Gallery and 3D Print Exchange. Life's a one-way journey; fallible, aging humans with creasing, crumbling bodies naturally see great promise in a technology that has the potential to create replacement body parts and tissue. That's why doctors were among the earliest people to explore 3D printing. Already, we've seen 3D printed ears (from Indian company Novabeans), arms and legs (from Limbitless Solutions, Biomechanical Robotics Group, and Bespoke), and muscles (from Cornell University). 3D printers have also been used to produce artificial tissue (Organovo), cells (Samsara Sciences), and skin (in a partnership between cosmetics giant L'Oreal and Organovo). Although we're some way away from having complete 3D printed replacement organs (such as hearts and livers), things are rapidly moving in that direction. One project, known as the Body on a Chip, run by the Wake Forest Institute for Regenerative Medicine in North Carolina, prints miniature human hearts, lungs, and blood vessels, places them on a microchip, and tests them out with a kind of artificial blood. Apart from replacement body parts, 3D printing is increasingly being used for medical education and training. At Nicklaus Children's Hospital in Miami, Florida, surgeons practise surgery on 3D-printed replicas of children's hearts. Elsewhere, the same technique is used to rehearse brain surgery. Designing and testing airplanes is a complex and expensive business: a Boeing Dreamliner has about 2.3 million components inside it! Although computer models can be used to test quite a few aspects of how planes behave, accurate prototypes still need to be made for things like wind-tunnel testing. And 3D printing is a simple and effective way to do that. While commercial airplanes are built in quantity, military planes are more likely to be highly customized—and 3D printing makes it possible to design, test, and manufacture low-volume or one-off parts both quickly and cost-effectively. Photo: The US Navy has been testing 3D printers on ships since one was installed on USS Essex in 2014. In theory, an onboard printer makes a ship more self-reliant, with less need to carry spare parts and materials, especially during wartime. This is a 3D-printed undersea wireless charger, typical of the objects that might be printed during a mission at sea. Photo by Devin Pisner courtesy of US Navy. Spacecraft are even more complex than airplanes and have the added drawback that they are "manufactured" in tiny quantities—sometimes only one is ever made. Instead of going to all the expense of making unique tools and manufacturing equipment, it can make much more sense to 3D print one-off components instead. But why even make space parts on Earth? Shipping complex and heavy structures into space is difficult, expensive, and time-consuming; the ability to manufacture things on the Moon, or on other planets, could prove invaluable. It's easy to imagine astronauts (or even robots) using 3D printers to produce whatever objects they need (including spare parts), far from Earth, whenever they need them. But even conventional, Earth-spawned space projects can benefit from the speed, simplicity, and low-cost of 3D printing. The latest, human-supporting NASA Rover uses 3D-printed parts produced with help from Stratasys. Making prototypes of airplanes or space rockets is an example of a much broader use for 3D printing: visualizing how new designs will look in three dimensions. We can use things like virtual reality for that, of course, but people often prefer things they can see and touch. Increasingly, 3D printers are being used for rapid, accurate architectural modeling. Although we can't (yet) 3D print in materials such as brick and concrete, there's a wide range of plastics available and they can be painted to look like realistic building finishes. In the same way, 3D printing is also now widely used for prototyping and testing industrial and consumer products. Since many everyday things are molded from plastic, a 3D printed model can look very similar to the finished product—perfect for focus-group testing or market research. From plastic toothbrushes to candy wrappers, modern life is here-today, gone-tomorrow—convenient, inexpensive, and disposable. Not everyone appreciates off-the-shelf mass production, however, which is why expensive "designer labels" are so popular. In the future, more of us are going to be able to enjoy the benefits of affordable, highly personalized products custom-made to our exact specification. Jewelry and fashion accessories are already being 3D printed. Just as the Etsy website created a worldwide community of artisan crafters , so Zazzy has now replicated that using 3D printing technology. Thanks to simple online services like Shapeways, anyone can make their own 3D printed nick-nacks, either for themselves or to sell to other people without the expense and hassle of using their own 3D printer (even Staples is now offering 3D printing services in some of its stores). 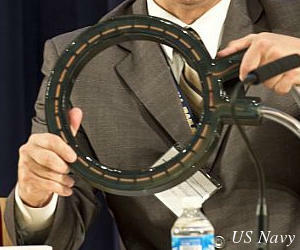 Photo: In theory, you can make 3D prints from any raw material you can feed into your printer. Here are some fantastic 3D objects printed with granulated sugar by a "CandyFab 4000" (a hacked old HP plotter) by the always entertaining folk at Evil Mad Scientist Laboratories. Photo by courtesy of Windell H. Oskay, www.evilmadscientist.com, published on Flickr in 2007 under a Creative Commons Licence. Many people believe 3D printing will herald not merely a tidal wave of brash, plastic gimmicks but a revolution in manufacturing industry and the world economy that it drives. Although 3D printing will certainly make it possible for us to make our own things, there's a limit to what you can achieve by yourself with a cheap printer and a tube of plastic. The real economic benefits are likely to arrive when 3D printing is universally adopted by big companies as a central pillar of manufacturing industry. First, that will enable manufacturers to offer much more customization of existing products, so the affordability of off-the-shelf mass-production will be combined with the attractiveness of one-off, bespoke artisan craft. Second, 3D printing is essentially a robotic technology, so it will lower the cost of manufacturing to the point where it will, once again, be cost-effective to manufacture items in North America and Europe that are currently being cheaply assembled (by poorly paid humans) in such places as China and India. Finally, 3D printing will increase productivity (since fewer people will be needed to make the same things), lowering production costs overall, which should lead to lower prices and greater demand—and that's always a good thing, for consumers, for manufacturers, and the economy. RepRap: A community Wiki for developers of 3D printer technologies. 3D Printing for Dummies by Richard Horne and Kalani Kirk Hausman. Wiley, 2017. An accessible, practical guide for complete beginners. The title is slightly misleading: much of the book is about building your own RepRap-type printer. 3D Printing: Build Your Own 3D Printer and Print Your Own 3D Objects by James Floyd Kelly. Que, 2014. A very clear introduction—suitable for absolute beginners. Fabricated: The New World of 3D Printing by Hod Lipson and Melba Kurman. John Wiley, 2013. A readable and accessible introduction to current and future applications of 3D printing. Makers: The New Industrial Revolution by Chris Anderson. Random House, 2012. Explains how 3D printing will revolutionize small-scale manufacturing by empowering individual "makers." Printing in Plastic: Build Your Own 3D Printer by Patrick Hood-Daniel and James Floyd Kelly. Apress, 2011. A hands-on way to learn about 3D printing, written very much in a practical, hobbyist style. New Bioprinter Makes It Easier to Fabricate 3D Flesh and Bone by Eliza Strickland. IEEE Spectrum, May 16, 2017. An update on state-of-the-art 3D medical printing. 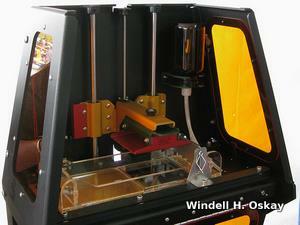 3D Printer Head-to-Head: Reviewing Two 3D Printers Under $300 by Tekla Perry. IEEE Spectrum, March 27, 2017. A review of two low-cost printers. 3D Printing: Are You Ready for the New Decentralized Industrial Revolution? by Sukamal Banerjee, HCL Technologies. Wired, February 2015. How will 3D printing affect manufacturing industry and the economy? 3D Printers Are No Rival for Mass Production by Nick Allen and 3D Printing Will Be a Manufacturing Engine for the Economy by Daniel Hamermesh. The New York Times, 12 August 2014. Will 3D printing change the world? Two very different perspectives are offered here. From toys to cars—what will you make on a 3D printer? by Dan Simmons, BBC News, 19 November 2012. A seven-minute video introduction to the things you can do with 3D printing. Transplant jaw made by 3D printer claimed as first: BBC News, 6 February 2012. 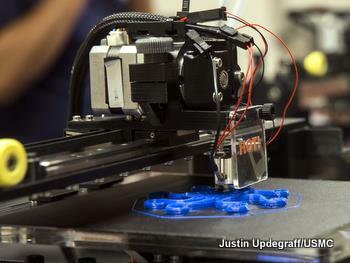 How 3D printers are now being used in medicine—and a glimpse of what the future holds. The disruptive future of printing: Technology commentator Bill Thompson considers a future where we can print solid 3D objects at the push of a button. From BBC News, 30 April 2010. 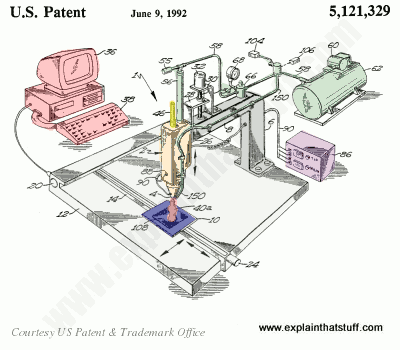 US Patent 5,121,329: Apparatus and method for creating three-dimensional objects by S. Scott Crump, Stratasys Ltd, June 9, 1992. Describes one of the world's first 3D printers using the method now known as fused depositional modeling (FDM). US Patent 5,204,055: Three-dimensional printing techniques by Emanuel M. Sachs, Massachusetts Institute Of Technology. April 20, 1993. B9Creator is a trademark of B9Creations, LLC.